TortoiseForum.org - Check out these photos of a breeder digging up a nest of Aldabra tortoise eggs. 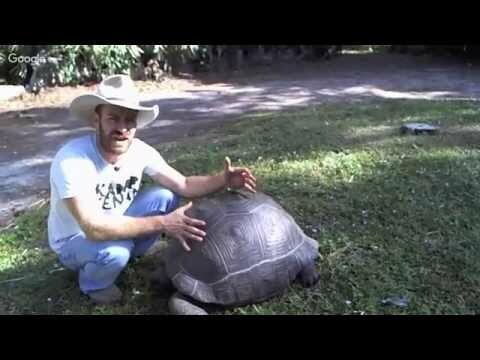 YouTube - Kenan Harkin hangs out with Nostradamus the Aldabra tortoise and tells us about Aldabra tortoise care on this episode of Kamp Kenan Live. TortoiseForum.org - A cool series of shots featuring a mother Aldabra tortoise digging her nest and the beautiful pearly white spheres that resulted. TortoiseForum.org - Tortoise Cove shares photos of a large cherryhead redfoot tortoise making a nest, and the excavation of the eggs that she laid for incubation. TortoiseForum.org - This handsome Aldabra tortoise named CupCake is growing up quite nicely.